Miso soup is a staple in Japanese cuisine, and I was hooked after I tried it a few years ago at Asiana restaurant in Pewaukee. This light and salty soup is surprisingly easily to make yourself and provides numerous health benefits from reducing the risk of breast cancer to providing an excellent source of fiber, protein, and minerals. *I always use yellow miso paste, which is sweet and creamy (shown in the photo above). **The store I purchase tofu from only has 12.3 ounce packages, so I use about half of the package. 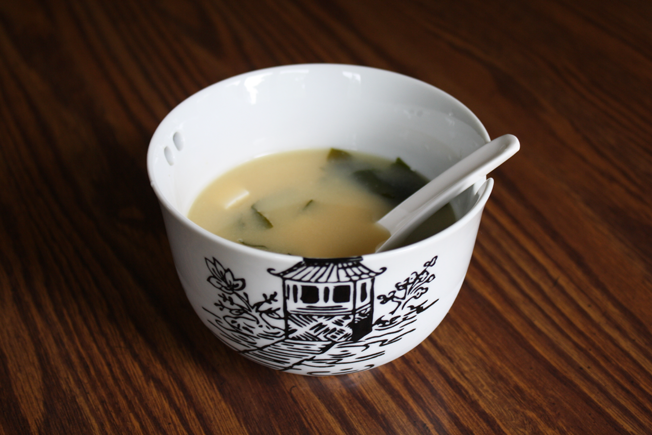 In a medium-sized saucepan over medium heat, combine dried wakame and water and bring to a boil. Once the dried wakame has fully bloomed, whisk or stir in the miso paste. Stir in the tofu and add the green onions to the soup. Simmer gently for 5-6 minutes, stirring occasionally, before serving or until all the miso paste has dissolved enough so there are no pieces remaining. This recipe is very forgiving, so you can adjust the amounts to your personal preferences. I usually add a little extra seaweed and sometimes another green onion. I also occasionally include udon noodles or sliced mushrooms. Enjoy!